Posted on June 30, 2018 by Mrs P.
First line: Isaiah’s crib looked like every other house on the block except the lawn was cut even, the paint was fresh, and the entrance was a little unusual. 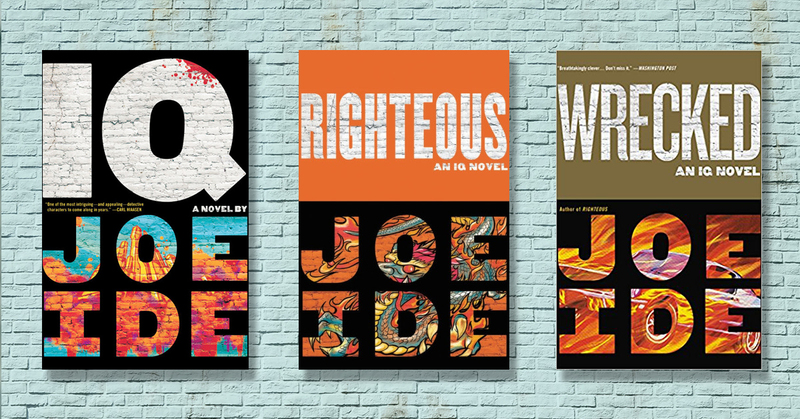 I’d heard lots of good things about Joe Ide’s IQ, the first in the ‘Isaiah Quintabe’ series, and on finishing it, can say that this novel is easily one of my most enjoyable and satisfying reads of the year. It’s a remarkably polished debut that introduces us to a wonderfully original detective, tells an absorbing coming-of-age story, and treats us to a cracking crime investigation bristling with intriguing characters. Oh, and it’s also extremely funny. The opening immediately had me hooked. It starts out with one of those depressingly familiar prologues in which a creepy guy in a pick-up truck is stalking a young girl with malevolent intent. As a seasoned crime reader you think, uh oh, I know exactly where this is going. And then it begins to go the way you thought it would…until all of a sudden it very much doesn’t, heading off in such a gloriously unexpected direction that you feel like cheering. And at that moment, you know you’re in for something very special. Isaiah Quintabe – or IQ – is an unlicensed African-American private investigator who lives in Hurston, a deprived neighbourhood on the edge of East Long Beach in Los Angeles. He solves ‘local cases where the police could not or would not get involved’, and as he often takes payment in kind (sweet potato pie, a new tire or a live chicken), finances are tight. Which is a problem because there are hefty bills to pay. Isaiah’s cash-flow difficulties will force him to work with Juanell Dodson, a hustler and former housemate of IQ’s, with whom he shared a dark chapter of his adolescence. And Dodson will provide the key to learning about IQ’s past and its consequences, while also accompanying him into the world of rap to solve the central investigation. Things I loved about this novel: it takes features we associate with iconic detectives – especially Sherlock Holmes and Easy Rawlins – and fuses them into a highly original PI whose intelligence sizzles off the page, but who also knows how to handle a Determinator HX Grenade Launcher. It effortlessly entwines IQ’s backstory with the present-day narrative and crime investigation. It creates three-dimensional characters who are often extremely flawed, but who also ring true, while leavening their depictions with an affectionate, sardonic humour. It’s gripping, authentic, beautifully written, and a lot of fun. You can read an extract from the first chapter of IQ on Joe Ide’s author website. The second in the series, Righteous, is already out, with the third, Wrecked, on its way this October. This entry was posted in 5 stars, America, Book reviews, By country by Mrs P.. Bookmark the permalink. You’ve sold me, Mrs. P. I’d heard of this book, but didn’t know anything about it. It does sound fantastic, though, and it’s nice to know that authors are doing different things with their crime plots, and not creating ‘same-y’ sorts of plots. Does sound right up my street. Thanks, Mrs P! You’re welcome, Christine! Hope you like!